Pipes lay on the ground at the wastewater treatment plant site on August 25, 2017, in Palmview. PALMVIEW — While the plan to bring sewer services to the city is finally being realized, the actual construction of the project has come with some headaches, namely, damage to residential streets. After months of haggling, the city of Palmview and the Agua Special Utility District have both finally approved interlocal agreements to repair road damage caused by the wastewater project. The Palmview Wastewater Project, led by Agua SUD, only called for patchwork on the roads to fix the damage. But after complaints from residents, the city said they would pay for the entire overlay of the roads. Before work is to get underway, though, the city first wants to connect empty lots to the sewer line so that roads won’t have to be torn up again to connect those lots after the streets have been paved. The effort was split into two separate interlocal agreements which were both approved by the Agua SUD board on Monday. The Palmview city council had already approved the agreements during a Feb. 6 meeting. The first focused on the connection of those empty lots. “We’ve been working on this agreement for a few months with the (Agua SUD) board and our council,” said Leo Olivares, Palmview’s interim city manager, addressing the Agua board of directors. For the connections, the city leveraged $950,000 out of $2.5 million in a certificate of obligation bonds. 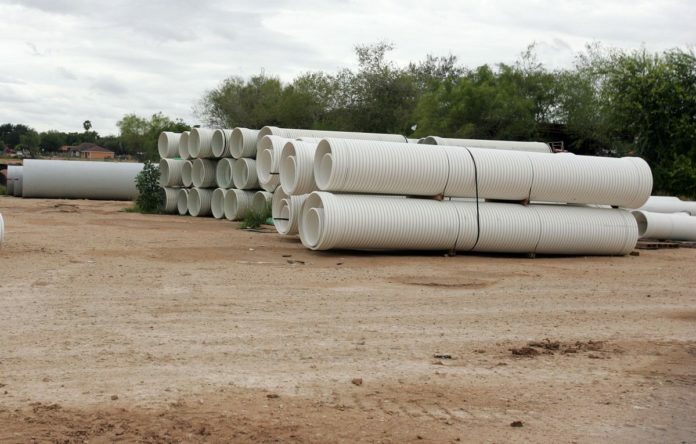 Eddie Saenz, interim general manager for Agua SUD, said the Texas Water Development Board, which is funding the Palmview Wastewater Project, had questions about whether the funding for the connection would be available. Olivares assured that those funds would be in place the following day. Later in the week, Rachel Chapa, finance director for the city of Palmview, confirmed the funds were available. With that assurance, the agreement was quickly approved by the board with board member Ricardo Ochoa the only one not present at the meeting. However, the second agreement, which dealt with the paving of streets, raised a lengthier discussion over timing. To pave the streets, the city will be entering into another agreement with Hidalgo County Precinct 3, the signing of which was still at least two weeks away, according to a representative for the precinct. However, the contractor for the first part of the Palmview Wastewater Project, L&G Construction, estimates they will be ready to turn over many streets over to the city before the end of March. If the county isn’t ready to start working on those streets by then, the concern is the streets will be left unrepaired for a period of time. But Olivares said the city would conduct maintenance on the streets until the county was ready to start paving them. The Agua SUD board unanimously approved the agreement with an addendum clarifying the city’s responsibility to maintain the roads until the repaving can begin.